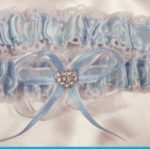 Pretty Blue garter with diamond on front and lace around edges. One size fits all. 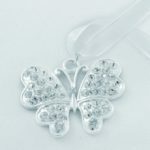 Silver plated diamond butterfly charm. A gorgeous double heart diamond charm. 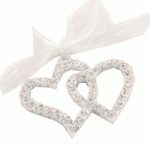 Double Heart with diamonds gift card attached to write a special message to the Bride. 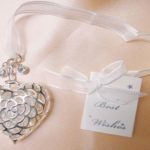 Silver plated heart charm with small card for personal message. I do shoe stickers size 3 x 3.5cm. Simply stick onto the bottom of each shoe single words of I and Do each shoe underneath. A nice idea for a brides ‘something blue’. Blue Shoe Stickers for something blue!! 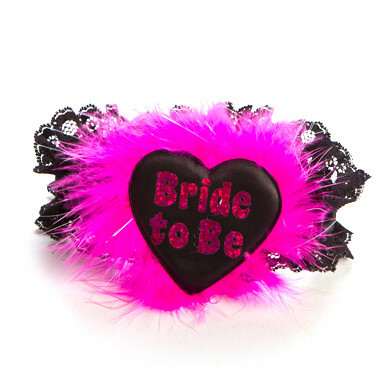 Place on the underside arch of the bridal shoes or on the top heel section for a blingy look. Ivory satin and organza garter with diamante and pearl heart detail with scattered rhinestones. One size fits most. Approximately 7cm wide. 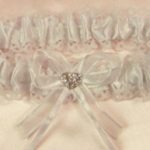 A simple ivory garter with lace trim and diamond heart on front. 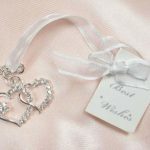 Ivory wedding garter satin and lace with butterfly crystal and blue bow on front. One Size fits all.